The Ultra Heat 24kW regular gas boiler is a highly dependable boiler that has been made by Potterton. It is condensing and wall mounted and comes with a variety of features and benefits to help make it a highly reliable unit. With it having an efficiency rating of 89.1% and output rating of 24kW it’s perfect for those homes that are medium sized with one bathroom and not a high demand for hot water or heating. With this unit also being available as a 12kW, 15kW, 18kW, 21kW and 24kW you can be sure there is an output to fit your needs. With this boiler being a regular unit it incorporates a boiler and a sealed hot water storage cylinder which is often fed by cold water storage cistern located in the loft and a feed and expansion cistern which is also located in the loft. With this in mind it is not suitable for those homes where space is limited. With this boiler not requiring a pump overrun or permanent live it saves time and hassle during installation. It is available with an industry leading choice of flue lengths, bends and compatible accessories. This is an extremely lightweight unit with it being said to be the lightest on the UK market - it weighs just 19.5kg. 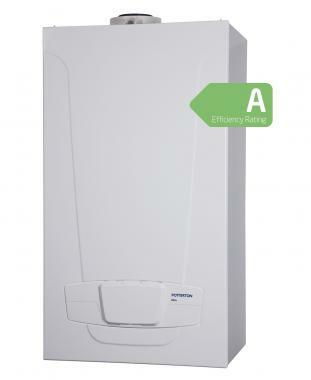 This boiler is also compact in size and is able to fit in a standard sized cupboard with ease. With this boiler having front and side access it helps for quick servicing and maintaining the boiler with ease. This boiler has a top central lead for ease of installation. With this boiler also being compatible with the Megaflo Eco cylinder it enables greater fuel savings when used together. This boiler also features 2 years warranty so you can be sure this boiler will not let you down.